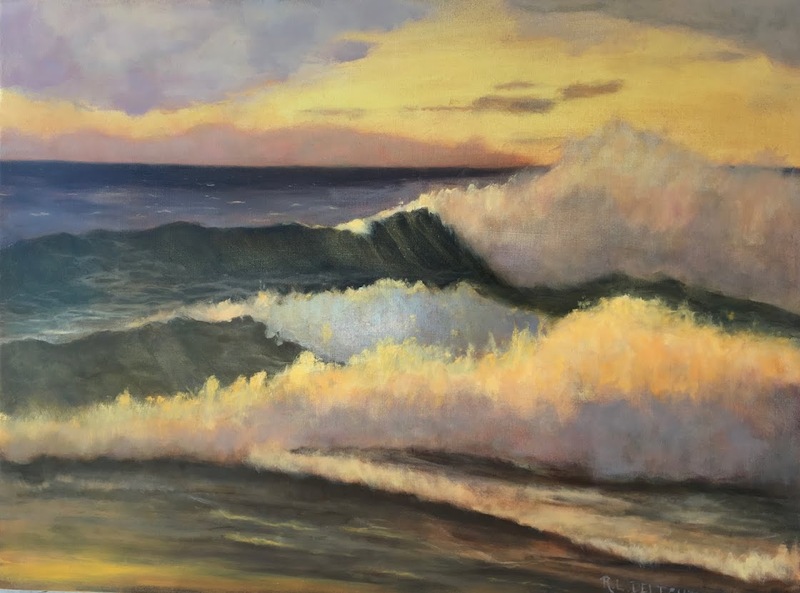 "Chaotic high surf will pose a threat to beachgoers tonight and Saturday before dissipating later on Saturday. Expect powerful west to northwest swells of 20 to 25 feet, with a period of 15 to 16 seconds." I was careful. I stayed sneaker wave distance away from the surf zone. Of course, it was still stormy. I got the sky laid in on the painting and then was hit by a hail squall. As you can see from the picture above, I folded my box a bit to protect my painting and palette and waited it out. All the white stuff, which looks shiny, on the sand is hail. I also had a hard time keeping it off my camera lens which is why there is a few blurry spots. I will have to remember to pack some goggles. The hail was stinging my face and eyes in spite of my hood pulled forward. After the squall passed I continued painting but I had trouble with water getting on my palette and into the paint. That makes it not want to stick. So I got what information I could and brought it home to finish. I worked a bit more on it before having to break off to do a few things. I will do my best to get it done tomorrow while it is still somewhat fresh in my head. ©2013 R.L. 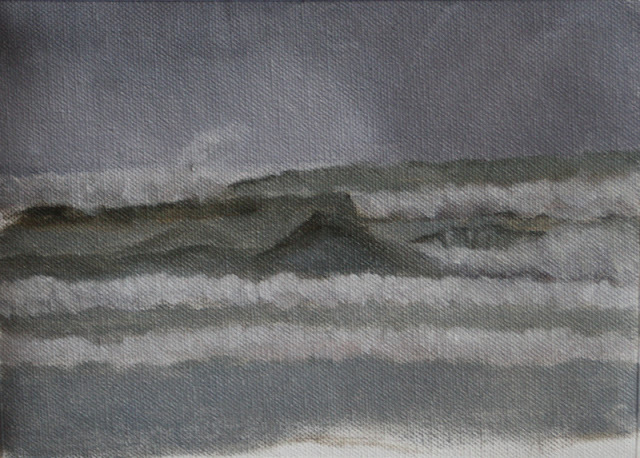 Delight, Wave Study #37-Hail and Fury, 6"x8" oil on canvas. In progress. Pretty dramatic sky and the crosswaves were pretty spectacular too. The lighting was almost eerie in its intenseness. This has a little bit to go still. I wanted to just get the basic elements and the value and color relationships in before having to break off. I barely got it in at that. There was a lot more action than I could or even would want to portray. And the sneaker waves? They were fast and frightening. I set myself up pretty far back and they never got less than 15 feet away from me but they would come roaring up the beach and I would hold my breath to see if they were going to jump the rocks and keep coming. 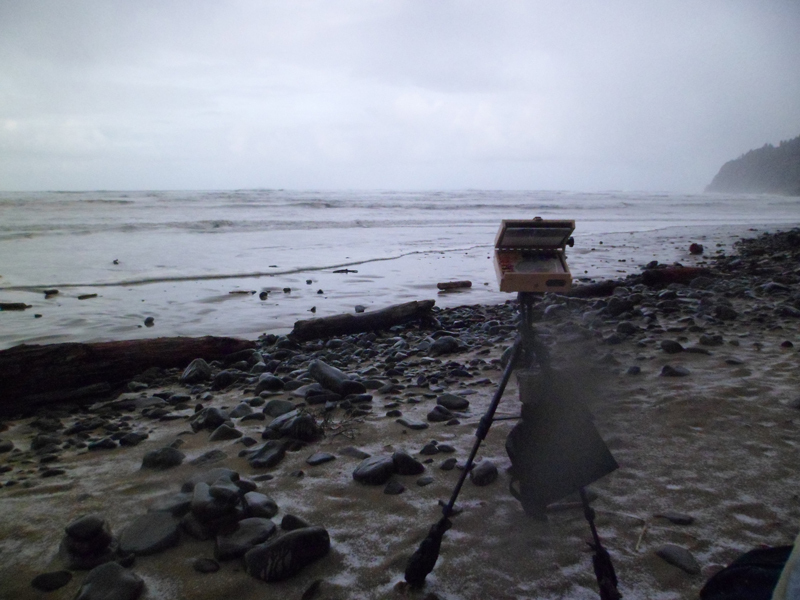 Even though I was painting at high tide, I still had to be fairly far away from the surf zone. Well, it has been a long day so I am off to bed. Life drawing in the morning. LOVE it and heck, it looks like a finished study to me!